Central University College is located in Accra and was started in 1998 by the International Central Gospel Church (ICGC), as a short-term pastoral training institute to provide Christian-based tertiary education. This institution aims to raise virtuous and transformational leaders for our world, leaders who are committed to the expansion of God’s kingdom. Both undergraduate and graduate programs are offered to prospective students. Central University College is committed to nurturing a vibrant academic community ideal for study, creation, and dissemination of knowledge through training, research, and service. The Changing Ways Bible College and Seminary is a division of Changing Ways Ministries and is located in Accra, Ghana. This Bible College provides individually tailored degree programs to fit the student’s denominational and educational requirements. Both Undergraduate and Graduate level studies are offered. Students are privileged with the opportunity to earn their Associates, Bachelors, Masters or Doctorate Degrees in Biblical Studies. Changing Ways Bible College was established with the aim of providing adequate, affordable and quality bible training for people aspiring to be leaders in Christian ministries. The Christian Leadership Training Institute collaborates with individual churches to develop leadership from within, using contextualized resources that enable the church to grow. The Institute was established in 1996, to enable churches to develop their leaders through seminars, extension classes, and resource materials. There are no resident classes at the Amrahia (Accra) campus. All of the work is done through the local churches in Ghana, Liberia, Nigeria and Côte d’Ivoire. In Ghana, the Institute primarily works with the Fellowship of Christian Churches. The Institute establishes and supervises extension training classes, as well as leadership seminars, youth leader seminars and women enrichment seminars. The Institute publishes Bible study materials and videos for evangelism and discipleship training, and assists in developing Youth Ministry within the local church. The Christian Service University College, located in Kumasi, is an academic centre of excellence in research, teaching, and service in Theology, Applied Science and Humanities. This college gives its students the benefit of a sound ethical and evangelical environment for learning. CSUC aims to be an excellent Evangelical Christian University that promotes knowledge about Christ through the training of men and women who are passionate about service, are excelling academically and are morally upright. The Department of Theology offers certificate, postgraduate certificates, Bachelor of Arts and Master of Arts courses. Half scholarships that are valid for one academic year are available to applicants with SSSCE or WASSCE aggregate six to 12. This half scholarship caters for half of the tuition fee for one academic year but may be extended to subsequent years subject to academic achievement, as well as high Christian, moral and ethical standards, and integrity. The Good News Theological Seminary is an interdenominational institution of higher learning founded in 1971 that provides biblical, theological and pastoral education primarily to leaders of the Africa Instituted Churches (AICS). It is located in Accra, Ghana. Provision of sound Christ-centered education to the church and society, as well as fully equipping both men and women with character, knowledge, and skills for servant leadership in Africa are the main goals of this institution. Students get to experience learning that encompasses the core values of this seminary – diligence, spirituality, and wisdom. Some of the courses offered at Good News Seminary include Bachelor of Theology, Diploma in Pastoral Ministry, and Certificate in Pastoral Ministry. Ghana Christian University aims to become the Premier Christian University in Africa by advancing excellence through transformational leadership. This institution was established in 1966, under the name Ghana Christian College and Seminary. It aims to equip leaders with a Christian World View that will enable them to transform communities and organizations. GCU offers certificate, diploma and undergraduate courses, including a Bachelor of Arts in Theology focusing on Christian Leadership, Cross-Cultural Ministries, Youth Ministries, Conflict Management and Biblical Languages. Ghana Bible College was established in 1962 by missionaries from the Cedars Church of Christ in Delaware, United States. On offer to students are Certificate, Diploma, and Undergraduate programs in Bible and Christian Ministry, and Sacred Ministry. 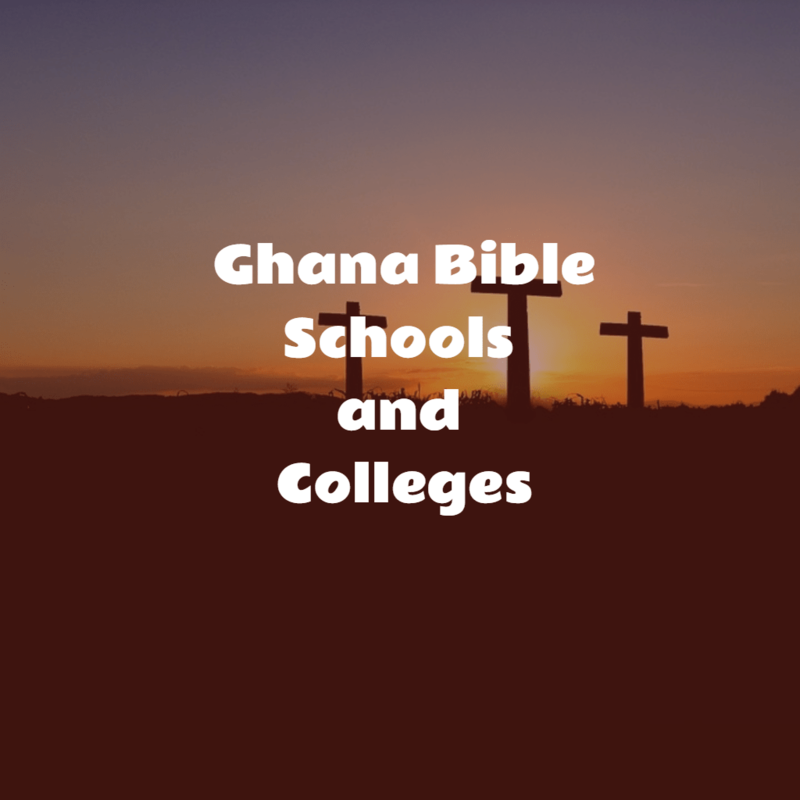 Ghana Bible College seeks to become a centre of excellence in training Christians to provide selfless service and quality leadership to the church and society. Development of the Christian faith and promotion of evangelism through the training of church leaders and providing Christian education to all are the key goals of this institution. The Trinity Theological Seminary was founded in 1942 as a joint ecumenical effort between the Methodist Church Ghana, Presbyterian Church of Ghana and the Evangelical Presbyterian Church. Two other churches, i.e. Joint Anglican Diocesan Council of Ghana and African Methodist Episcopal Zion Church later joined this ministerial training effort. This Seminary exists to offer Christian training, guidance, teaching, practical experience and counseling to leaders with the aim of making their ministry more holistic. Based in Accra, Trinity has a rich cross-cultural environment, hosting foreign students from all over Africa as well as visiting lecturers from all over the world. The study areas include Biblical Studies, Pastoral and Practical Theology and many others. Certificate, Diploma, Undergraduate and Postgraduate programs are on offer at this institution. The Akrofi-Christaller Institute of Theology, Mission, and Culture is an academic and pastoral institution that trains Christian workers and leaders to be effective missionaries in the African continent. Located in the Akropong-Akuapem region of Ghana, this institution has made the development of academic programs that provide adequate tools for creative and serious research into African Christianity and its contribution to World Christianity a priority. During their study period, students get the opportunity to participate in meaningful and relevant theological research. This institute focuses mainly on postgraduate studies. Scholarships are available for students who have evidence of leadership credentials in the church and community. Recipients of the institute’s scholarships are expected to return to their home communities after graduation. CDM Bible College is an interdenominational institution located in Adenta-Accra, which seeks to train, teach and build Christ-like character, as well as reproducible biblical models that will be pillars of truth in their generations. Training Christ-like disciple makers who know their calling from God and understand the urgency of the Great Commission is the main goal of the CDM Bible College. The founders of this college believe that there is a need to train strategic and faithful disciple-makers who will complete the Unfinished Task in this generation. This college offers a Certificate and Diploma in Missions and Disciple Making.